Think, feel, and laugh! Let us take your event to a whole new level! The Mechanicals will tickle your funny bone, touch your heart, and inspire you to see the world in a different way. Our actors perform scenes, performance pieces, and monologues from Broadway and beyond. Call 215-922-1141 for a brochure or to book us for your event. 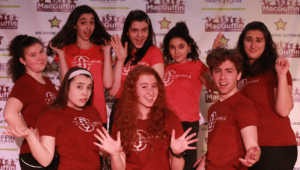 The Mechanicals Acting Troupe is a select group of highly trained actors from MacGuffin Theatre & Film Company with direction by Emma Ditnes and Liz Fredette. Current performers include: Sophie Borgenicht, Lily Cohen, Andrea Guíllen, Elena Eisenstadt, Mira LeVine, Max Mester, Isabella Salvi, and Niamh Williams. We perform October – June and are available to tour in Philadelphia and surrounding areas, including New Jersey. Performance rates for a 45-60-minute show: $200 for general public.